The ELTROPULS process allows you to optimise the surface morphology of your part, taking into account the material and application. An optimum compound zone and diffusion zone can be formed that will match material properties to the application requirements. 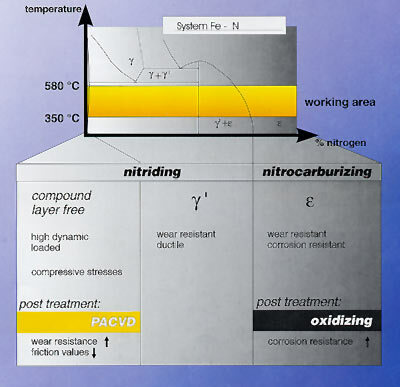 The characteristics of the nitrided surface can be controlled to produce a variety of results, influencing the final hardness profile, including: the structure, nitrogen content and thickness of the compound zone, the final concentrations of the new elements added to the surface, and the nitrogen concentration gradient in the diffusion zone. The ELTROPULS process is completely reproducible. Process parameters are microprocessor controlled and optimised throughout the heat treatment cycle, to produce the best metallurgical results. Parts can be heated in the shortest possible time, in vacuum, by radiation or in an inert atmosphere, with natural or forced convection. Even the most complicated programs can be easily reproduced. After reaching the end of the heat and soak steps, the part can be automatically cooled. The cooling method can be selected to meet the requirements of the part - slowly, in a vacuum to insure freedom from distortion, or more quickly, in an inert atmosphere with natural or forced convection, for high throughput and productivity. Passivated surfaces can be activated by sputter cleaning. Critical chemical reaction kinetics are improved by sputtering. This ensures uniform temperature of the parts and allowing loading of a maximum number of parts in the furnace. Using the smallest amount of power for the process prevents overheating of thin sections (as occurs with technologies lacking pulse duration and duty-cycle control). This guarantees consistent nitrided layers whether full loads or partial loads are run. Load size is not critical. Parts with different geometries can be treated at the same time. Cold-Start to Cold-Stop processing permits small batch operations without utility cost penalties. ensures a beneficial surface modification operation at minimum expense. All of these features permit high parts production with the best metallurgical quality. With the ELTROPULS process all possible nitrided layers can be created. The ductile g' layers are normally 2 to 8 mm thick and the e layers, which also have good corrosion resistance, have a thickness of up to 20 mm. Both layer types display good wear resistance. Optimal layer thickness and type can be tailored to meet specific application requirements by the ELTROPULS process. For dynamic highly loaded parts or tools, a think g' layer or compound-free layer with high compressive stresses is recommended. The properties of nitrided layers can be further improved with post treatments. Post oxidation gives the parts a decorative appearance and improves the corrosion resistance. Hard coating enhances hardness and wear resistance and reduces friction. The ELTROPULS-process can produce all of the mentioned layers at low cost with precise repeatability. Optimal shape control is guaranteed to prevent postnitriding machining.